In Washington there is a move to create a "truth commission," supposedly to get to the bottom of what went wrong over the last eight years. That might work for a nation without established laws, or a constitution that has clearly defined parameters for Treason and for flagrantly criminal behavior; but it is insufficient for what has happened to the United States. In creating this madness, each additional crime was built upon the crimes that went before. These were crimes that went nearly unchallenged by a traumatized public that did not choose to question anything which the traitors first created and then claimed as "facts." The most perfect of these were the super-flawed attacks on 911 that over seventy-five percent of the population now finally have come to believe, were definitely "an inside job." 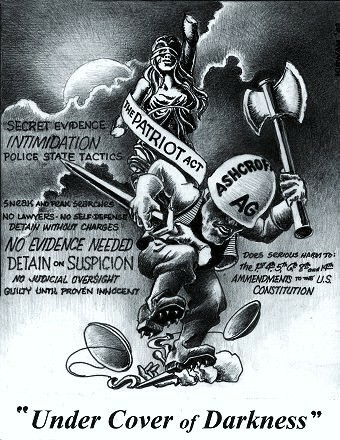 To insure that their Treason's were secure from investigations or challenges, the government began a huge effort to intimidate and isolate their critics with a series of Draconian seizures and denials of guaranteed rights in the US Constitution-based upon a lamely crafted "License to Kill" which the congress illegally bestowed upon the office of what they called the Commander-in- Chief. The truth was that the congress surrendered their powers' to check and oversee the president, in what the Dictator had termed "a time of war." There was a war, but it was not the one on Afghanistan or Iraq: It was the Cheney-Bush War-Upon-America that required these new illegally created powers, in order to guarantee, that this nation would lose everything in the end: And they almost succeeded. They were only stopped by millions of individuals that fought them at every turn, from locations the world over, wherever free men and women took up the mantle of responsibility, and the need for consequences, in the face of overwhelming criminal-force. With the admission yesterday, of Patrick Leahey's committee, that 'the truth must come out,' the stage is set for the acceptance of this "Confirmation" that has vindicated the millions that have been fighting this takeover from the beginning. In brief the 'conspiracy theorists' were right all along-there was a conspiracy: But it was not the critics of the administration that were the crazies: It was all those supposedly main-stream politicians the world over, that were in on this first massive series of crimes in our already blood-drenched twenty-first century. In the last few days the inheritors of the Dictatorship have launched a wide-ranging road-show to feed the various horrors which their predecessors; including many in Obama's cabinet, that were more than instrumental in creating the impossible situations that millions of Americans are now facing. It seems we have summit-level emergencies now, almost every day-but the pace and problems at issue in this box of band-aids, is hopelessly insufficient to do anything more than buy the current traitors just a little more time, to finish what they're still trying to pull off-to end of our way of life. What can we do at this late stage? For the answer to this question we have to look inside ourselves, beyond the horrifying but fleeting distractions, that this administration, in concert with the previous two, have laid before us like field after field of cluster-bombs, to stop the real investigations that must happen: If any of this is to be brought to the clear and absolute conclusions that responsibility requires, by creating the very real and lifelong consequences that must be decided on-before we can even begin to move forward on any front. This is true; because virtually all of the causes for every part of what we face today come directly from these massive insider-crimes that we failed to prosecute for the last five decades. The money, the health-care that we still don't have, even our corrupted and crime-ridden civil society, along with our self-serving and criminally illegal foreign-policies on all fronts: All of it can be traced back to the 'Money, Greed & Illicit Power that has always lain beneath everything that was done and undone by the three braches of this government to the people of this nation, and by extension to the wider-world as well. This is not easy, but then having one's freedom and control over our own lives can get very messy-if those most deeply affected are not motivated to resist whenever and wherever Tyranny calls-this is a universal problem. To solve this we must look to the things that all people have in common, beginning with life & death: Because it is Life and Death that connects us all, to everything. We can no more 'stop death' than we can deny the depth of the crimes that we have allowed others to commit in our names. If we want to be able to live our lives, then we have to face what we have done to ourselves by remaining silent for decades! Many believe that this problem will end badly because it is inevitable: Nothing is inevitable, and the outcome of this attack upon us all, is still not yet written in stone, despite the many millions we have allowed to die: Because we chose not to see, to hear, or to know the depths of what our greed and complicity have brought home to the people of this nation. If we come together we can interrupt the seeming 'inevitability' but only if we unite to close the gaping wounds that we have allowed these Outlaws to inflict upon our self-absorbed world. This process must begin with real investigations-investigations that have real consequences-and not through some feel-good and contrived 'truth commission,' that is nothing more than a toothless farce that will vanish from the public memory as quickly as it has so-recently been formed. If there is to be a future then life must continue, and no actual life can exist upon the diet of lies and deceptions that we've all been feeding on for the past few decades. 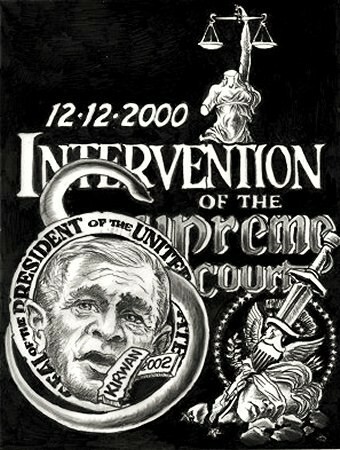 We must end the continuing cover-up of everything that happened after the Supreme Court illegally awarded the presidency to the Cheney-Bush- Dictatorship that led directly to the Treason of 911 and all that followed from the mass-murders of that day. There can be no "reality' without actual reconciliation: and beyond that there can be no change at all without real and lasting consequences for all the lies that hid the crimes that have gone before. The truth must be set free if there is to be "life" again in this country or the world. Many believed that the government would never 'confirm' that they have lied or tortured or especially that they have tried to steal this country, the constitution, and our way of life. But that's exactly the basis for these half-measures of Leahey's "truth-commissions," as strange as that might seem. It's never enough to say that 'incorrect decisions were made:' Just as it's not enough to say that 'policies were misguided.' TREASON was committed, mass-murder and Genocides along with war-crimes have been committed; this country has been taken hostage by the Zionists, whether we were being blackmailed or whether we went willingly makes little difference. We must deal with the facts as they are today-the United States of America is no longer the property of its citizens, and we no longer have a constitutional government-we need to come together and find a solution to these crimes that have been committed against us all. Use the free 800-numbers and deluge the Leahey committee with demands for actual reality. Tell the committee that unless they adhere to the US Constitution and take that god-damned gold-fringe of corporate ownership off the US flags in congress and in the hearings - then they will join those on the indicted lists.